I've fallen behind in trying out the techniques from the Watercolor for Card Markers class I was taking... So, I had some free time and thought I'd get caught up. Day 11 we had a video from Tim Holtz and what a fun technique using stencils. He showed a ton of samples using some of his stencils and they all looked very cool. I don't have any Tim Holtz stencils in my stash... so I used a polka dot one from Simon Says Stamp. All of my project up until now I've been using Stampin' Up! inks for all of my projects. Tim used the Distress inks in his video and they really do react better then any other inks when it comes to water. So I used the new 1" minis and pressed them into the stencil and then spritzed it with water and stamped the stencil onto a piece of SU watercolor paper. I wasn't sure what I was going to do with the panel once it was dry. I attached it to a Tempting Turquoise card base leave a 1/4" space along the right side. Then I stamped the sentiment from Lawn Fawn onto a piece of Vellum card stock using some SU white embossing powder. Then I die cut the clouds from some Whisper White and the Sun from a piece of Daffodil Delight using the Lawn Fawn Spring Showers Lawn cuts. ( I know way too much contraband on this project)!! This came out really cute and that background is so pretty with all the colors. Thanks for stopping by today!! I love all of the watercolor projects that I've seen lately. I so should've taken that class. I definitely will next time. Your card turned out great. 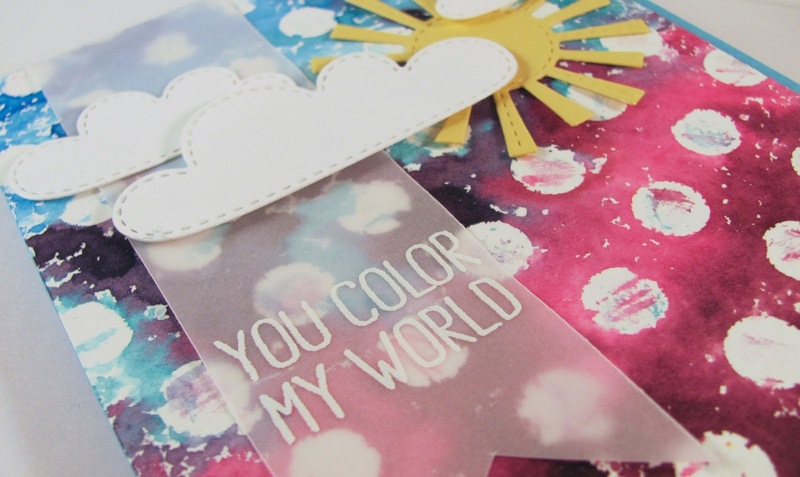 I l love Tim Holtz's distress inks! Great job, Holly! 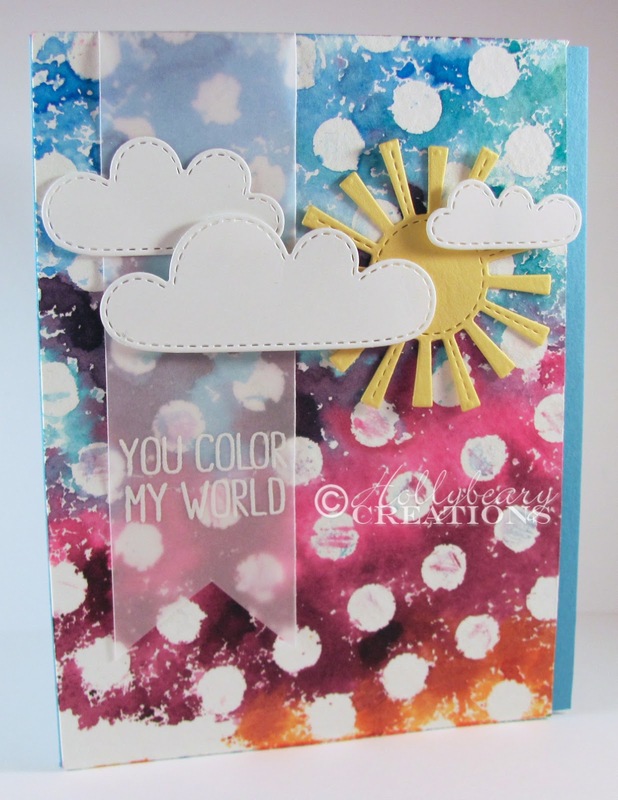 The SSS stencil is perfect, and I love the end result - wonderful card!